Our Stainless-Steel Adjustable O-Shackles are designed to be the ultimate shackle for any premium paracord products or crafts. Constructed with the focus on surpassing all necessary standards, our shackles are well equipped for both everyday use and emergency assistance. Don't be left without the amazing utility when you need it, try out our shackles today and experience the quality of Paracord Planet products. 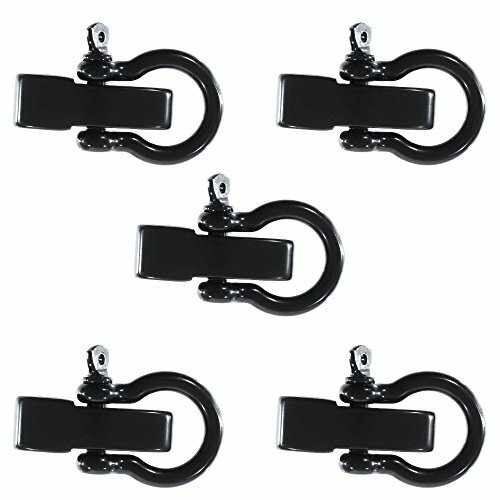 QUALITY YOU CAN RELY ON - This Paracord Planet Premium Stainless-Steel Survival O-Shackle 5 Pack is the perfect addition to all your high-quality paracord crafts and survival bracelet needs. They feature an all-black finish and easy to use design. COMPACT AND ADJUSTABLE - Our adjustable 3-possition clasp enables a single bracelet to be manipulated to fit multiple wrist sizes. Perfect for crafters seeking to design premium and high-quality paracord products or other exciting crafts. EMERGENCY READY - Our o-shackles are created with a large gate opening which greatly eases the attachment of the adjustable clasp or any other equipment. Furthermore, our clasp will stay strong throughout daily use and emergencies. LIFETIME GUARANTEE - Paracord Planet is a proud American owned and operated company. We specialize in only 100% American made high-quality survival and outdoor gear. We hope you love our products as much as we do and keep us with you for your entire lifetime.